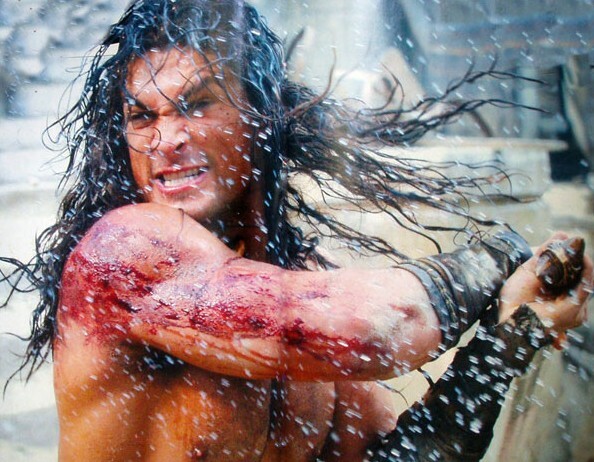 O Conan The Movie Blog divulgou uma nova imagem de Jason Momoa como Conan, desta vez ensangüentado e com sua espada em riste, provavelmente fatiando alguns inimigos para poder ouvir o lamento de suas mulheres. A trama desta nova versão contará a história de Conan, o cimério, e suas aventuras através do continente de Hibórea em busca de vingança pelo assassinato de seu pai e a destruição de sua vila. Haunted by memories, I push on this wheel. And help me to answer the riddle of steel. Helpless and timid, as weak as a girl. My mother beheaded, they took my whole world. Crom, where is the wizard who killed my mother? Still, I can recall his terrible gaze. Crom, where are the two snakes facing each other? Crom, if you’re my god then show me the way. Hacking and slicing, and look at me now. Each step I take I’m fulfilling my vow. And hear the lamentation of the women! Crom, show me the wizard who killed my mother. True I’ve never prayed to you before. Still, what would I give if you could help me see this through. And if you do not listen, then the hell with you. I prey to you Crom! And hear the lamentation of the women.